I was recently reminded by pravin to make a perfect vegetable lasagna (little mild). I normally use red sauce variety but this time I made it with white sauce. In this excitment, I neglected to remember that I didn't have most of the vegetables or cheese. As usual, emergency trip to the nearby grocery store. I used frozen spinach & egg is optional. Be generous in sprinkling the cheese to eat a nice & solid meal of vegetables with cheese toppings. 1. Heat butter in the saucepan, add bayleaf, minced garlic & finely chopped onions. Saute it for 3 mins. 2. Add the flour & stir it for 2 more mins. Add milk & bring it to boil. Keep stirring continously. 3. Filter the sauce & bring it to boil again. Add salt & pepper to taste. Keep aside. 4. Heat oil in the pan, add minced garlic & the vegetables. Add salt & cook till done. Finally add the pepper powder. Switch off the heat. 5. In a bowl, mix the spinach & egg. Keep aside. 6. Lightly grease the baking pan with the white sauce onto the bottom of the dish. 7. Cover with a layer of lasagna sheets. 8. 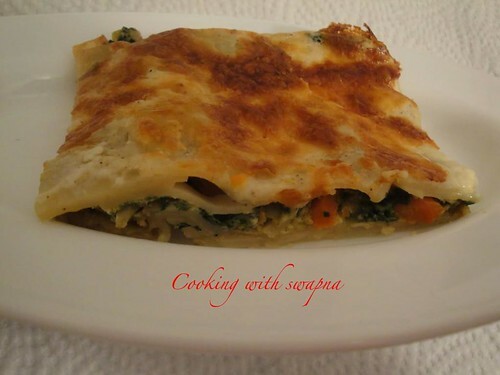 Top the lasagna with a layer of cooked vegetables, a layer of spinach, a layer of cheese and a layer of white sauce. 9. 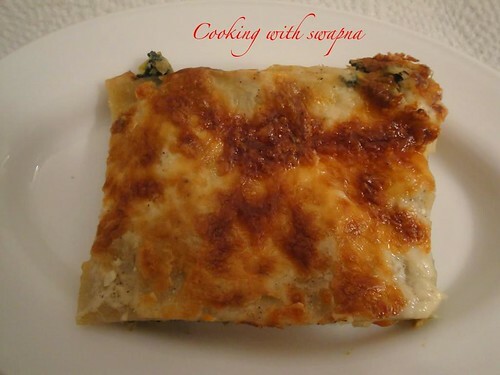 Repeat layering the lasagna, vegetables, spinach, cheese and sauce in this manner until all ingredients have been used, ending with cheese on top. 10. Bake until the lasagna is bubbling and golden brown, about 1 hour and 15 minutes at 350 F. Allow to rest 10 minutes before serving. Looks very very tasty, love to make it. Lasagna Looks yum!! Makes me hungry. 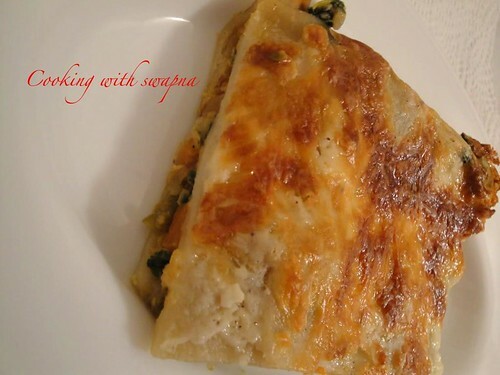 Wow Swapna, the crest looks very flaky and thin... th filling sounds so tempting!!! that looks so cheesy and delicious..